Opposition leader Salvador Nasralla, left, cheers along with former President Manuel Zelaya, at a rally where he reaffirmed his claim on the presidency of Honduras, in the central park of San Pedro Sula, Honduras, Jan. 6, 2018. Thousands of demonstrators led by opposition leader Salvador Nasralla gathered in Honduras’ second-largest city Saturday to protest the re-election of President Juan Orlando Hernandez in a vote they say was fraudulent. “We will not stop until Hernandez says he’s leaving,” Nasralla told supporters, many of whom chanted “JOH out!” referring to Hernandez. According to the official count, Hernandez won with 42.95 percent to 41.42 for Nasralla, a former sportscaster backed by a left-leaning coalition. 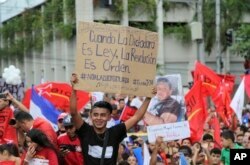 An opposition supporter carries a sign with a message that reads in Spanish: "When dictatorship is the law, revolution is an order," during an opposition protest in support of Salvador Nasralla, in San Pedro Sula, Honduras, Jan. 6, 2018. However the OAS, which had observers monitoring the election, called for a repeat of the vote, saying the official version of the count included “extreme statistical improbability.” An early lead by Nasralla disappeared after the public vote count mysteriously stopped for more than a day then restarted. Hernandez denies the vote was fraudulent and has called on Hondurans to accept his re-election. Some countries, including the United States, have recognized his victory. Street protests in Honduras left at least 17 dead last month but Saturday’s march went without incident.